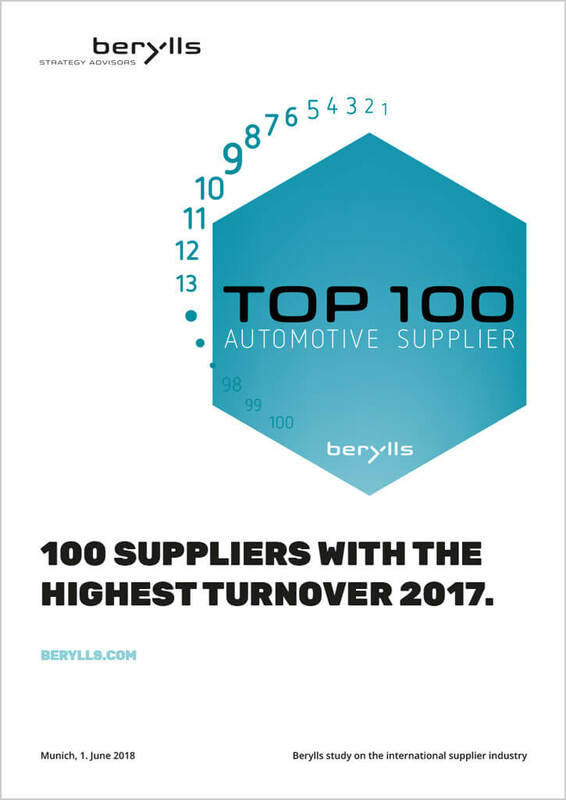 BERYLLS 2017 STUDY OF THE TOP 100 SUPPLIERS. SUPPLIERS BREAK ONE RECORD AFTER ANOTHER, AND ARE GROWING FASTER THAN MANUFACTURERS. 2017 was another strong year for the 100 biggest automotive suppliers. Total revenue grows to about 835 billion euros. At 1.1 percent growth is lower than in the previous year, but is strongly affected by exchange rate fluctuations. There are 18 German companies in the Top 100. All German suppliers improved their sales compared to 2016. Bosch and Continental defend first and second places. Debut: a total of four Chinese suppliers are represented among the Top 100, two of which have cleared the EUR 2.6 billion hurdle for the first time. Munich, June 1, 2018 – For the seventh time, Berylls Strategy Advisors has analyzed the world’s biggest automotive suppliers for its 2017 “TOP 100 suppliers study.” In 2017, entry to this club, was granted to companies with revenue of at least EUR 2.6 billion. The collective sales of the TOP 100 rose by EUR 9.3 billion to a new record level of EUR 834.6 billion. In 2017, a very positive image was shown by the group of 18 German companies, in particular: they grew their revenue by 7.5 percent in total, and, at 9.8 percent, increased profitability slightly on average compared to the previous year. Only the US companies, with a profitability of 10.2 percent are still ahead of the Germans. At the other end of the scale are the South Korean suppliers, more than half of whom suffered revenue declines last year. Exchange rate effects played a larger role in 2017 than in prior years due to the strong euro. Converted into euros, the Top 100 only attained an overall growth of 1.1 percent, lagging behind the growth of previous years. Expressed in local currencies, however, the revenue increase, on average, is significantly higher at 9.0 percent. HARDLY ANY MOVEMENT IN THE TOP TEN BOSCH, CONTI AND DENSO DEFENDED THEIR TOP-RANKING POSITIONS. Bosch, with revenue of EUR 47.4 billion (Mobility Solutions division), is the unchallenged number one in Berylls’s Top 100 suppliers study 2017, followed by Continental (EUR 44 billion) and Denso (equivalent to EUR 36.4 bilion). The top ranking trio thereby defended their positions of the two prior years. ZF Friedrichshafen (EUR 33.5 billion) climbed one place to 4th position, displacing Magna (equivalent to 32.5 billion EUR). In this year’s study of the Top 100, the picture is affected by significant exchange rate effects: the euro increased significantly in value by the reporting date of Dec. 31, 2017. For example, the euro gained twelve percent compared to the US dollar, and nine percent compared to the Japanese yen in the course of 2017. Since Berylls’s Top 100 supplier study converts company’s revenues into euros, these exchange rate effects eclipse the revenue increases that some companies achieved in their local currency. IN A DIRECT COMPARISON, SUPPLIERS SHOW STRONGER GROWTH THAN MANUFACTURERS. Nevertheless, 2017 was an outstanding year. The total sales of the Top 100 suppliers, at EUR 834.6 billion, was above the 2016 mark, when it was EUR 825.3 billion. Activity in the automotive industry is buzzing; worldwide, at 94.5 million cars, production was higher than ever (2016: 92,2 million, 2015: 88,2 million). The suppliers can even profit more from the booming total market than the automotive manufacturers: while revenue of the 100 biggest suppliers grew by 5.8 percent between 2015 and 2017, the ten biggest OEMs only expanded by 2 percent in the same period. German automotive suppliers showed even more positive figures, increasing their average profitability, which was already at a high level of 9.5 percent (2016) , to 9.8 percent in 2017. Revenue across all 18 companies grew by a total of 7.5 percent. Overall, the German suppliers thus moved up by six places on average into the Top 100 ranking. In 2017, they generated a total revenue of EUR 204.1 billion, and thereby made up the lion’s share of total European revenue of EUR 370.5 billion. The other European suppliers painted a picture similar to German suppliers. Revenue growth and improvements in the Top 100 ranking are the rule – with two exceptions. International Automotive Components Group (IAC), an American manufacturer of interior components based in Luxembourg, fell 21 places, after a significant proportion of the company – almost one site in four – was merged into a joint venture with a Chinese partner. Following a jump in revenue in 2016 (after taking over the interior business from Magna), Grupo Antolin suffered a slight decline in 2017 losing one place in the ranking. US COMPANIES ARE LEADERS IN TERMS OF RETURN. US suppliers, as a group (total revenue equivalent to EUR 117.8 billion) are way ahead in profitability with an average of 10.2 percent. Many US companies are emphatically setting a course toward the mobility of the future and departing from conventional business lines. Delphi is a typical example of the strategic direction of many US suppliers: The company has split into Aptiv (focus on the “new automotive world” in matters of connectivity and autonomous driving) and Delphi Technologies, and consequently fell in the ranking. The same is true of Visteon: still at place 39 five years ago, it only just made it into the Top 100 following a continuous downsizing process and comprehensive focus on display and operating instruments. However, not all US suppliers are following the trend toward divestment. The growth champions in 2017 still include a US company: American Axle. The manufacturer of driveline components increased its revenue by a record 39 percent by taking over Metaldyne (engine and drive components), increasing its expertise in the field of traditional drive technology and thereby climbing 14 places into the Top 100 ranking. There are only two companies who can look back at stronger growth in 2017: Freudenberg and Weichai Power. Freudenberg grew thanks to the complete consolidation of Vibracoustics (revenue growth: 40 percent plus 23 places in ranking) and is only trumped by Weichai Power. The Chinese supplier of diesel engines benefited from a strong domestic market in China and state subsidy programs, climbing 15 places to position 17 in the Top 100 ranking, with revenue growth equivalent to 68 percent. KOREAN SUPPLIERS SHOW SKID MARKS, THE CHINESE FORGE AHEAD. South Korean suppliers experienced a challenging 2017. With a total of six companies in the previous year, they represented a total revenue equivalent to EUR 49.3 billion (-EUR 2.6 billion compared to the previous year). South Korean companies not only struggled with declining revenues last year, but also shrinking returns. Thus, five of the six Korean companies in Berylls’s Top 100 Supplier Study 2017 saw declining profitability. The biggest exception was LG Electronics. The electronics giant from Seoul wants a bigger say in the mobility of the future, and has bolstered its Vehicle Components Division with additional expertise in the field of lighting systems and electronic modules. 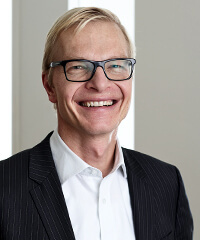 An important milestone was represented by the takeover of the Austrian supplier ZKW, which was officially announced in April 2018. It can be assumed that, by consolidating ZKW, LG will rise up the ranking next year. The 27 Japanese suppliers among the Top 100, on the other hand, can look back positively at 2017. In euro terms, which increased nine percent in value compared to the Japanese yen in 2017, they do present a weak picture with a revenue decline of 2.2 percent. However, in their local currency, only two of the companies represented in the ranking experienced declining revenues (Yazaki: -1.4 percent, Calsonic: -6.9 percent). The profitability of the Japanese companies, at 7.2 percent (EBIT or operating income) is on a comparable level to 2017 on average. With Bridgestone-Firestone, a Japanese company has even made it into the Top 10 of the profitability champions, which is otherwise dominated by US and European companies. Bridgestone-Firestone achieved 12.8 percent EBIT in 2017, significantly above the average for Japan. This can be attributed to the traditionally high proportion of aftermarket business held by the tire manufacturers, which is significantly more profitable than the OEM business. The ten most profitable suppliers therefore include a total of three tire manufacturers: besides Bridgestone-Firestone, also Pirelli of Italy and Michelin of France. The success of the Japanese is outshone by another Asian market: China. The “red giant” made strong progress in Berylls’s Top 100 supplier study 2017, and increased the number of listed companies from two in 2016 (Weichai Power, Yanfeng Automotive) to four. Weichai advanced to place 17, and Yanfeng, listed at 32 in 2017, received reinforcement from CITIC Dicastal (casting specialist, rank 74) and Ningbo Joyson Electronics (electronics and safety systems, place 75). Ningbo Joyson grew by taking over the insolvent airbag supplier Takata, which is consequently no longer listed in the Top 100. Along with a favorable internal market, Chinese companies continue to be fueled by state subsidy programs. Some of them (Wanxiang, Minth, CATL, BYD) are only just below the Berylls Top 100 and are promising candidates for coming years. TAKEOVERS AND SPIN-OFFS WILL CONTINUE AT FULL SPEED IN 2018. Upward and downward movements are of course a part of Berylls’s Top 100 supplier study. For many years, consolidations, spin-offs and company takeovers have been a source of extensive movement within the Top 100. In 2018, too, it is becoming clear that the rate of transformation in the auto industry will continue to speed up. After several years of a favorable economic environment, many companies have coffers filled to bursting, and increasingly see it as strategically urgent to position themselves in future-oriented topics. This is especially true of those companies whose commercial focus still lies in the automotive “old world.” Besides venture capital companies, the major Tier 1 suppliers are investing more and more in purchasing creative start-ups, hoping thereby to gain important stimuli for their core business. Expertise in the fields of connectivity, autonomous driving, big data, shared mobility and the electrification of mobility is increasingly a crucial factor in the auto industry’s success. The key companies in the Top 100 long ago realized and understood that, besides Google, Apple and the other tech titans, the Chinese, too, have entered the race for the OEMs’ budgets. And it is emerging that some Chinese suppliers are already well prepared to leave established companies in the dust within the next few years, and to oust them from Berylls’s Top 100.